In the foreground Itlandsen the Peacebringer. Â Does playing a superhero improve your physical body? Â My tentative experience so far is, yes, slightly. This seems unlikely, but what is the alternative? It happened again. I came home from work and almost immediately hopped on the exercise bike. I stopped after a few minutes though, because my pulse was almost 20 beats above my norm for the warm-up. This is usually a sign that the body is busy fighting an infection, although it also happens the day after a particularly hard exercise or physical work. So I got off the bike and also cancelled the long walk I was planning afterwards. 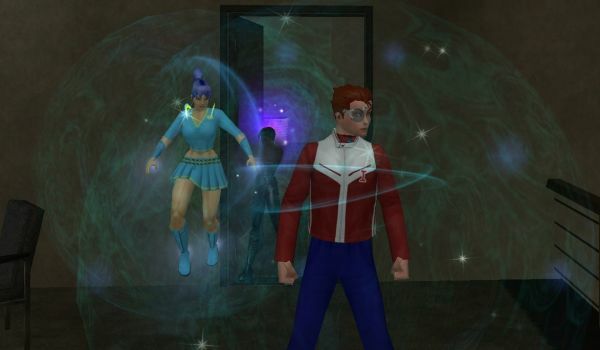 I made a light dinner, read and wrote a little, and logged on City of Heroes, the superheroic online multiplayer game. I logged on with my Peacebringer character, as is good and proper, since this is an archetype whose powers are all based on light. Â ^_^ It is also very team-friendly. My character can transform into a giant space lobster that can draw enemy fire away from more vulnerable team mates. I joined a team with 4 other random players, we spent two hours saving the imaginary city from imaginary evil cyborgs. After this I checked my pulse again, and it was back to normal. Now, doing this task force is pretty hectic, since I am not responsible only for myself so I cannot take breaks or slow down. Despite this, my body had somehow regenerated during the evening. OK, perhaps it was the dinner rather than the game, but that is not much more credible. (I was not so hungry as to be anxious or anything, I am not really prone to hunger weakness etc, I eat when my stomach gnaws or occasionally because I have good leftovers.) And this is the second time I notice this, although the first time I was duoing at a more relaxed pace. More testing is in order! This entry was posted in games, my health by itlandm. Bookmark the permalink.